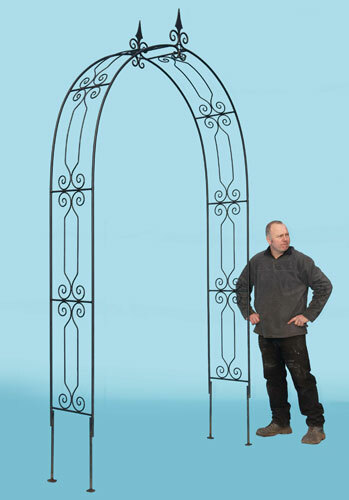 This arch has hand forged scroll infills and the finials are also made of hand forged scrolls and hand forged points. This photo shows 'extended legs' which is one option of securing arch once in situ. The other option is to have pins (about 18" long) which need to be knocked through holes in the base. Price as above: £360 (standard semi-black eggshell paint and size as below). For different size / finish / etc please see our specifications page.